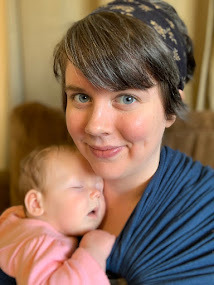 Okay, so, Anna has asked me to hold her accountable, and on Tuesday, she suggested I even do so through my blog. (I then, of course, told her to get her own blog). Buuut I ended up telling her that if she didn't follow through and do the workouts she told me she was going to do this week, I would tell the world she is a liar. So there. She didn't go to the Pilates class she said she was going to on Tuesday, and she overslept or dawdled around or something this morning and missed yoga class. Tsk tsk tsk. She told me once that the picture on the left was her Photo of Revelation (which I, ahem, borrowed from her Facebook page; don't kill me, Anna! And, er, I also creepily blacked out her mom's face; I wasn't sure she'd want to be featured here, lol). Anyway. Photo of Revelation. The wake-up call. It's been a couple of years since that picture was taken. She gradually lost weight since then and has been more quickly and noticeably shrinking since last August. 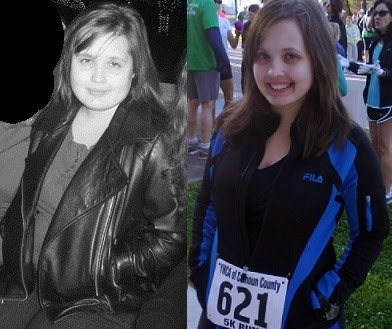 I took the picture on the right in April at one of the 5Ks we did together. Hasn't she gotten tiny?!? Although she looks fantastic, she's still not quite where she wants to be on the scale. She's only a few pounds away from her goal weight, and she's really been struggling to get there, especially lately. She has also just been accepted into a PhD program in Texas (which means she'll moving far away from me. :*( But I'm not even gonna go there today...). 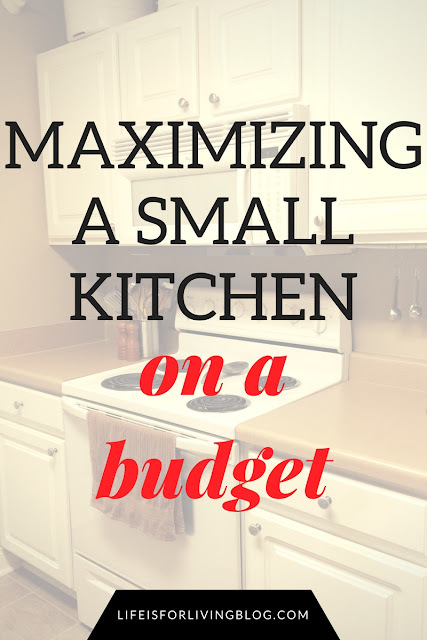 We're both a bit worried that the stress resulting from this huge move combined with working on a PhD plus not having a workout buddy to exercise with throughout the week will cause her to revert back to her old couch potato habits. So she really needs to get back on track before all that extra stress is added into her life! Oh yeah. And tomorrow is her 26th birthday. I know she wants to have a healthy, positive beginning to another year of life. Her attitude and eagerness to make positive changes in her own life have played an enormous part in my own weight loss journey. We've been checking on each other constantly since last August, when we first started meeting to walk. She's been so supportive and encouraging and willing to do anything she could to help me out, and I want to do the same for her. So, Anna, stay strong!!! Remember where you used to be. Remember how far we've come- from getting together to make and eat homemade bacon cheese fries or Gooey Cheesy Deliciousness while we watched Smallville to doing 5Ks, even a 10K! Don't stop now! You're so close to your goal! Run, you clever girl! And remember! Now, as far as my own efforts to get back on track go, today was another great day. Since I wrote so much at the beginning, I'll try not to ramble so much from here on. I'll try. 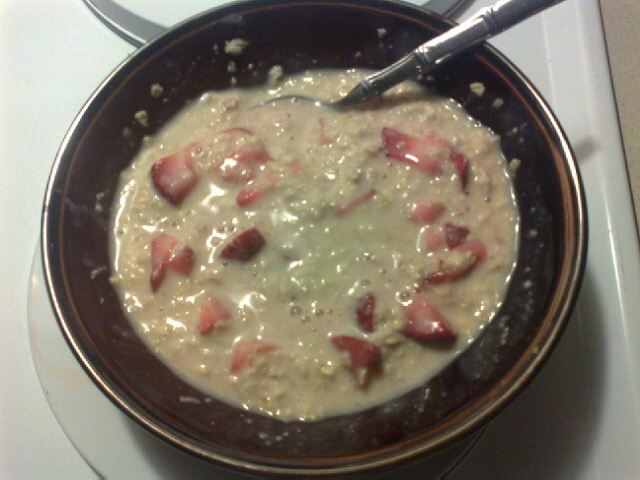 "Strawberries and cream" oatmeal: 1 pack plain, unsweetened, instant oatmeal, sliced strawberries, spoonful of plain nonfat Greek yogurt, and about a teaspoon of honey. 1 cup unsweetened green tea. UGH. I'm so sorry. My pictures are getting homelier by the day. 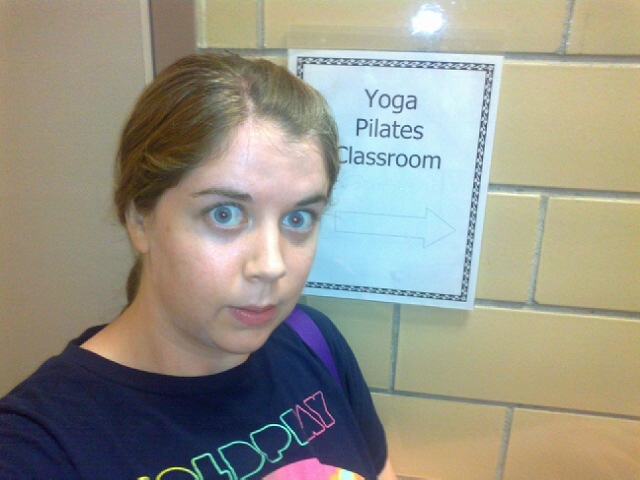 I couldn't exactly take a picture during yoga class, so I had to be sneaky and get a creeper shot by the sign in the hallway. Proof I was there. The class is an hour long, and I thoroughly enjoyed it. I really love yoga. 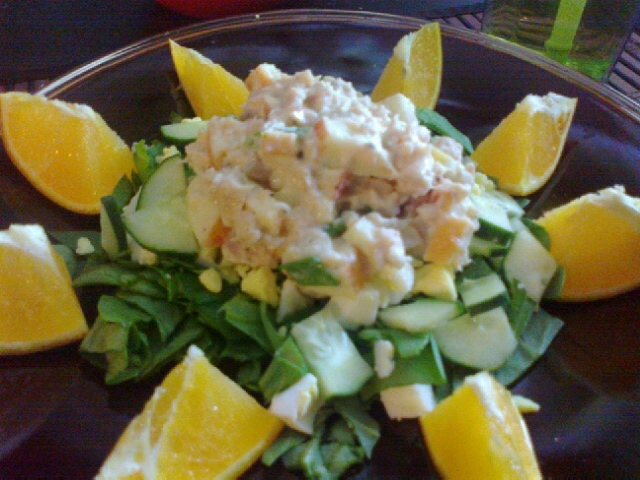 1 serving homemade tuna salad (1 can of tuna, about 2 tbsp olive oil mayo, 1 small chopped apple, chopped green onions, garlic, seasoned salt, black pepper, and a dash of parmesan cheese makes 2 servings) on a bed of spinach, cucumbers, and 1 chopped boiled egg. I also had 1/2 navel orange, which I sliced and placed decoratively around the main dish to make it look more impressive than it really was. (It was good, though. Really.) 2 cups water. I must confess: while I was getting the potatoes ready to go into the oven, I popped about 12 raw almonds. I didn't take a picture. It just sort of...happened. I somehow didn't have a "real" afternoon snack today. I spend the afternoon writing, and I got so caught up in it, I actually forgot about food. Love when that happens! So rare. A fantastic dinner. 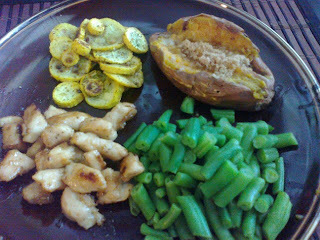 I did one of my favorite go-to recipes, garlic brown sugar chicken, steamed green beans, a baked sweet potato with 1 tbsp olive oil butter spread and 1 teaspoon brown sugar, and baked squash (fresh from the garden!). 4 cups water. This is really strange, but I didn't want a snack after dinner. I'm still quite full. So, I will be calling it a day now. Tomorrow is Friday! You and Anna's friendship is quite inspiring! Together you guys are pretty unstoppable...you can do anything! And GBS chicken is my favorite. I could eat about 7 servings of it. Only one more day of this week left! Not that that means "I'm throwing in the towel and Imma eat whatever I want while watching 5200 episodes of Doctor Who" this weekend. Just that we've been doing GREAT this week and week one of major lifestyle change is almost to a close! Aww, thanks! I'm so proud of you for how hard you've been working this week! Seriously, I'm very impressed! Let's keep it up! And luckily for us (I guess in this case, at least), there's only 119 episodes of Doctor Who on Netflix, and we've already knocked out the first, what, 16? So this weekend, we can eat all the carrots and cucumbers we want while watching 103 episodes of Doctor Who! Allons-y!